1.1. DATE. This lease is dated for reference purposes only ___________. 1.2.1 LANDLORD: COMMERCIAL PROPERTY LANDLORD, INC.
1.2.2 TENANT: AGREEABLE TENANT, INC.
(Section 2.1) The entire parcel of land legally described in Exhibit A and all improvements thereto. 1.5(a). COMMENCEMENT DATE. Notwithstanding anything to the contrary contained herein or in the Work Letter, Landlord and Tenant acknowledge and agree that the construction of the Initial Tenant Improvements may be completed by Tenant on a floor by floor basis, with the Commencement Date occurring on the earlier of (a) four (4) months after the Substantial Completion of the Building Shell, as adjusted for any Tenant Delays such that the date of Substantial Completion of the Building Shell, for purposes of this Section 1.5, shall occur on the date that the Building Shell would have been Substantially Complete but for any Tenant Delays (the terms Initial Tenant Improvements, Landlord’s Work, Substantial Completion, Tenant Delays, and Building Shell are defined in the Work Letter attached to the Lease as Exhibit B, the “ Work Letter ”)), or (b) the date that Tenant occupies the first, second and third floors of the Premises and commences business operations thereon, following the date that Tenant obtains a temporary or final certificate of occupancy for the Building. If Tenant occupies one or more floors (but not all floors) of the Premises prior to the Commencement Date for the Premises (the “ Early Occupancy Period ”), Tenant shall be obligated to pay Minimum Monthly Rent for only the floor(s) of the Premises occupied during such Early Occupancy Period from the date that any portion of such floor is occupied by Tenant for the purposes of operating Tenant’s business therein (and not solely for the limited purpose of installing its furniture, fixtures and equipment therein); provided that such early occupancy shall also be subject to the other terms of the Lease and the Work Letter, including but not limited to Tenant’s obligation to provide Landlord with proof of Tenant’s insurance as set forth in Section 6.3.3. The Minimum Monthly Rent payable for a floor during the Early Occupancy Period shall be equal to one-third (1/3) of the Minimum Monthly Rent payable for the Premises during the first full month after the Commencement Date. Following the Commencement Date, Landlord shall deliver written notice to Tenant of the Commencement Date (as may be adjusted herein) after finally determining the same, and unless Tenant delivers written notice of objection to Landlord within five (5) business days after receiving Landlord’s written notice of the Commencement Date, Tenant shall be deemed to have approved of, and shall be bound by, Landlord’s determination of the Commencement Date. 1.5(b) EXPIRATION DATE. The last day of the calendar month in which the fifteenth (15th) anniversary of the Commencement Date occurs. 1.6 TERM (Section 3.1) Approximately 180 months, expiring on the Expiration Date. 1.7 RENT. The Minimum Monthly Rent for the Initial Year shall be determined in accordance with the terms and provisions of Exhibit D (the Calculation of the Building Minimum Monthly Rent During the First Year of Term). 1.8 OPERATING EXPENSE/MONTHLY PAYMENT (See Section 6.1): Initially an estimated amount to be provided by Landlord after the date of this Lease. 1.10 USE. Except as provided in the last sentence of this Section 1.10, the Premises shall be used solely for pharmaceutical/biotechnology research and for pharmaceutical/biotechnology manufacturing, marketing and distribution and any other use generally associated with diagnostic and pharmaceutical development and production, and for those other uses associated therewith, including but not limited to general office space, vivarium space, cold room and glass washing facilities, and radioactive material and chemical storage space, and employee amenities such as a gymnasium and a cafeteria. Notwithstanding the foregoing, any use of the Premises which is permitted by law and consistent with other activities conducted on the Premises is permissible. 1.11 CONTENTS Included as part of this Lease are Exhibits A through J, which are attached hereto and incorporated herein by this reference. 2.1 Description. Landlord hereby leases to Tenant and Tenant hereby leases from Landlord, the real property described in Exhibit A (the “ Real Property ”), together with the entirety of the building to be constructed by Landlord along with the other improvements to be located thereon (collectively, the “ Premises ”) to be constructed by Landlord and Tenant, respectively, in accordance with the Work Letter, including, but not limited to, an “underground” parking structure (the “ Underground Parking Structure ”), a service loading dock, ramp and adjacent loading area, surface parking, the Loading Area (as defined in Section 5.2), and an outdoor patio area (“ Patio Area ”), all substantially in the size and location as set forth in the Design Documents, all of which are reserved for the exclusive use of Tenant and its employees, contractors, agents, invitees and guests throughout the Term of this Lease as part of Tenant’s leasehold interest in the Premises, subject to (i) any other rights of Landlord set forth herein, (ii) any matters of public record existing as of the date of this Agreement, and (iii) any other rights or matters that are reasonably necessary for Landlord’s development of the Property as contemplated herein (such as a reciprocal driveway easement or the Reciprocal Parking Easement defined in Section 25 below) (collectively, the items in clauses (i) through (iii) above are referred to herein as “ Landlord’s Reserved Rights ”). Landlord shall not, subject to the Landlord’s Reserved Rights, operate or make available any portion of the Premises for use by any person other than Tenant during the Term as long as Tenant is not in default under this Lease. Tenant shall have the exclusive right, subject to Landlord’s Reserved Rights, to use the Patio Area for employee dining, and for Tenant’s social and/or business functions, with no additional rent for such use payable by Tenant. The “Rentable Square Footage of the Building” is estimated to be approximately ____________ square feet. Prior to the Commencement Date, the Building will be measured by Landlord’s Architect (as defined in the Work Letter) in accordance with BOMA measurement standards pursuant to BOMA ANSI Z65.1-1996, revised and readopted June 7, 1996; provided, however, that except as otherwise expressly set forth herein, no floor area of the Building (nor of the Underground Parking Structure, Patio Area or Loading Area) other than (a) the first, second and third floors of the Building and (b) those portions of the upper level garage within the Building constituting a lobby area and/or used for circulation to the elevators, shall be included in the determination of the Rentable Square Footage of the Building (i.e. regardless of whether any portion of the Underground Parking Structure, Loading Area or the Building roof includes any storage areas, machinery or electrical rooms or HVAC chiller facilities, such areas shall not be included in the calculation of the rentable square feet of the Building for purposes of determining Tenant’s Minimum Monthly Rent payments and Landlord’s contribution of Tenant Improvement Allowance. If such measurement results in a change in the Rentable Square Footage of the Building from the number stated above, the Minimum Monthly Rent and the other provisions of this Lease based on square footage shall be recalculated accordingly. Rentable square footage of the Loading Area shall be measured in accordance with Section 5.2 below. Before commencement of the Initial Tenant Improvements, Landlord and Tenant will attempt to reach an agreement on the rentable square feet of the Building. If Landlord and Tenant are unable to mutually agree upon the rentable square footage of the Building, either Landlord or Tenant shall have the right to demand that the parties submit the dispute as to the rentable square feet of the Building to a third party space management professional jointly for resolution. Should such a demand be made, then within ten (10) days after either party delivers written notice to the other of such demand, the parties shall select an independent third party space management professional to resolve the dispute (the “ Space Management Professional ”). Landlord shall initially retain the Space Management Professional, but the costs and expenses of the Space Management Professional shall be split between the parties (with Tenant paying Landlord its share of such costs and expenses within thirty (30)days after receiving an invoice from Landlord requesting payment thereof). Thereafter, within ten (10) days after the parties select the Space Management Professional, each party shall deliver to such Space Management Professional, in a sealed envelope, their determination of the rentable square footage of the Building. If a party fails to deliver its determination of the rentable square footage of the Building to the Space Management Professional within said ten (10) day period, and thereafter, if such party fails to deliver its determination of the rentable square footage of the Building to the Space Management Professional within five (5) days after receiving written notice from the other party demanding that its determination be delivered to the Space Management Professional, then the determination of the party providing its determination of the rentable square footage of the Building to the Space Management Professional shall be binding on the parties. Should both parties timely deliver their determination of the rentable square footage of the Building to the Space Management Professional, then within forty-eight (48) hours after receiving both determinations, the Space Management Professional shall call a meeting of the parties, and during such meeting, the Space Management Professional shall open the envelopes containing the parties determinations of the rentable square footage of the Building. If such determinations differ by less than one percent (1%) of the lower number, then the rentable square footage of the Building shall be the average of those two determinations, which number shall be binding on the parties. Moreover, upon such determination, Landlord and Tenant shall set forth such rentable square footage of the Building based on such process in a writing signed by Landlord and Tenant. If such determinations are equal to or more than one percent (1%) of the lower number, then the Space Management Professional shall field measure the rentable square feet of the Building in accordance with this Section 2.1. Thereafter, the determination of the parties as to the rentable square footage of the Building (as set forth in their submittal to the Space Management Professional) that is closest to the measurement determined by the Space Management Professional shall be the Rentable Square Footage of the Building for purposes of this Lease, and shall be binding on the parties, and shall be set forth, in a writing, signed by both Landlord and Tenant. Once the Rentable Square Footage of the Building is determined as provided in this Section 2.1, the Rentable Square Footage of the Building shall not be subject to re-measurement. 2.2 Initial Tenant Improvements. Initial Tenant Improvements to the Premises shall be completed in accordance with the terms and provisions of the Work Letter attached hereto as Exhibit B (the “ Work Letter ”). 2.3 Delivery. Tenant shall accept possession of the Building Shell as of the date of Substantial Completion of the Building Shell, subject to the terms and conditions of the Work Letter and Landlord’s rights set forth therein to complete any Punch List Items, and Tenant’s taking possession of the Building Shell on that date shall be conclusive evidence that Tenant accepts the Building Shell in its then existing condition, and that the Building Shell was in good condition at the time possession was taken, subject to the Punch List items associated therewith. Tenant shall accept possession of the Premises as of the date of Substantial Completion of Landlord’s Work, subject to the terms and conditions of this Lease, the Work Letter and Landlord’s rights set forth therein to complete any Punch List Items, and Tenant’s taking possession of the Premises on that date shall be conclusive evidence that Tenant accepts the Premises in its then existing condition, and that the Premises were in good condition at the time possession was taken, subject to the Punch List items associated therewith. Tenant agrees and acknowledges that, except as expressly set forth elsewhere in this Lease and the Work Letter, neither Landlord nor any agent of Landlord has made any representation or warranty with respect to the condition of all or any portion of the Premises or the Real Property, and/or the suitability of the Premises or the Real Property for the conduct of Tenant’s business. 2.4 Construction Defects. Notwithstanding anything to the contrary in Section 2.3 above, Landlord shall, at Landlord’s sole cost and expense, repair or replace any “Construction Defects” (defined below) that Tenant notifies Landlord of, in writing, during the Landlord’s Warranty Period (as defined in the Work Letter). Such repair obligation is referred to herein as “ Landlord’s Warranty .” Such costs and expenses shall not be included as an Operating Expense. Moreover, if Landlord is obligated hereunder to correct a violation of Landlord’s Warranty, such corrective work shall be completed within thirty (30) days after Landlord receives notice of such Construction Defect from Tenant; provided however, if by the nature of such correction more than thirty (30) days is required to effect such correction, Landlord shall not be in default hereunder if such correction is commenced within such thirty (30) day period and is diligently pursued to completion. This Exhibit D forms a part of that certain Lease (the “Lease”) by and between COMMERCIAL PROPERTY LANDLORD, INC., as Landlord, and AGREEABLE TENANT, INC., as Tenant, to which this Exhibit is attached. All capitalized terms referred to in this Exhibit shall have the same meaning provided in the Lease, except where expressly provided to the contrary in this Exhibit. This Exhibit D establishes the means of determining Minimum Monthly Rent only, and shall not modify the respective rights and obligations of Landlord and Tenant under the Lease or Work Letter; and in the event of any discrepancy between this Exhibit D and any contrary provision of the Lease or Work Letter (except for the Minimum Monthly Rent payable under the Lease), the terms and conditions of the Lease and Work Letter shall prevail. The Building Minimum Monthly Rent for the first one year period after the Commencement Date (the "Initial Year”) shall be calculated as set forth in this Exhibit D.
A. The “Actual Total Project Costs” is an amount per rentable square foot (“RSF”) equal to (1) the Total Project Cost per RSF as shown in the Project Budget Summary attached hereto as Schedule 1 (which is $432.49 per RSF), plus (2) the Sum of the Cost Factor Adjustments; with each Cost Factor thereof comprising the “ Actual Project Cost Factor ” of each such category of Cost Factor. For purposes of this Exhibit D, the term “RSF” means the rentable square foot of Building. B. The “Adjusted Return Rate” is defined as the sum of the Landlord’s Actual Financing Interest Rate and the Rate of Return Spread. i. 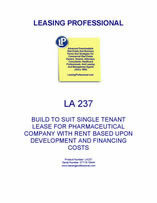 The “Loan Finance Costs” is defined as all out of pocket financing costs, fees, and interest charges associated with any permanent loan or construction loan (per actual RSF) that are incurred by Landlord pursuant to Landlord’s financing of the acquisition of the Real Property for the period from the acquisition of the Real Property by Landlord until the Commencement Date, and such financing costs, fees and charges incurred by Landlord to finance the construction and development of the Landlord’s Work and/or the payment of the Tenant Improvement Allowance. ii. The “Entitlement and Permit Fees” is defined as all out of pocket costs incurred by the Landlord (per actual RSF) for any and all entitlements and permits necessary for, or associated with, the development of Landlord’s Work. Such costs include, but are not limited to, all consultant fees, engineering fees, design fees, and building permit, mitigation, water quality control, city planning and entitlement fees. Notwithstanding anything to the contrary contained herein, for purposes of determining the Actual Project Cost Factor for the Entitlement and Permit Fees, such Actual Project Cost Factor shall not exceed the amount of the Capped Entitlement and Permit Fees described in Section 4 below. iii. The “Shell and Site Construction Costs” is defined as all other out of pocket costs (exclusive of the Loan Finance Costs and the Entitlement and Permit Fees) incurred by Landlord (per actual RSF) for the design, construction and/or development of the Landlord’s Work, including, but not limited to, any associated off-site costs for signalization and median modification required as a condition to the building permit or entitlement approvals for the Landlord’s Work, including, but not limited to, all labor costs, construction costs, material costs, bond costs, and insurance costs to the extent associated therewith; provided, however, that the foregoing shall not result in the payment of any Entitlement and Permit Fees as part of the Shell and Site Construction Costs. Notwithstanding anything to the contrary contained herein, for purposes of determining the Actual Project Cost Factor for the Shell and Site Construction Costs, such Actual Project Cost Factor shall not exceed the amount of the Capped Shell and Site Construction Costs as described in Section 4 below. E. The “Landlord’s Actual Financing Interest Rate” is defined as the actual interest rate that the Landlord obtains for the permanent financing of the Real Property and all improvements constructed and to be constructed thereon (collectively, the “ Project ”), which financing Landlord shall obtain after the Effective Date and prior to the Commencement Date. Landlord’s long term financing will be secured from a reputable institutional lender such as a regional or national bank, life insurance company or comparable source. F. The “Landlord’s Baseline Financing Interest Rate” is Landlord’s assumed financing interest rate for the Project, as set forth in the Project Budget Summary, which is an amount equal to Seven percent (7%). G. The “Landlord’s Budgeted Rate of Return” is equal to .093, which was determined by dividing the Landlord’s budgeted Initial Year Rent for a 12 month period, equal to $40.20 per RSF per year ($3.35/month times 12 months), by the budgeted amount for the Landlord’s Total Project Costs per RSF, as shown in the Project’s Budget Summary set forth in Schedule 1 attached hereto (initially estimated to be equal to $432.49 per RSF). H. The “Project Budget Summary” shall mean the initial schedule of Total Project Cost set forth in Schedule 1 attached hereto. I. The “Rate of Return Spread” is equal to .023 and is determined by taking the difference between the Landlord’s Budgeted Rate of Return (.093) and Landlord’s Baseline Financing Interest Rate (.07). J. The “Sum of the Cost Factor Adjustments” is an amount calculated as follows for each Cost Factor: (i) determine the difference between the actual costs incurred by Landlord with respect to such Cost Factor (but without including any amount of Entitlement and Permit Fees or Shell and Site Construction Costs in excess of the Capped Entitlement and Permit Fees and Shell and Site Construction Costs) and the amount of the Baseline Cost Factor for such Cost Factor as set forth in Section 1.C of this Exhibit D; and (ii) sum all such Cost Factor differences; however, if any such Cost Factor difference is a negative number, then subtract the absolute value of that difference.